See details DAP 10314 WEB PATCH 90 (DRY MIX) SIZE:4 LBS. 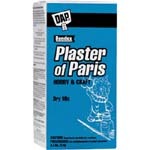 See details DAP 53005 PLASTER OF PARIS HOBBY & CRAFT (DRY MIX) SIZE:4.4 LBS. Ideal for hobby, molds and casts. Sets fast in 20-30 minutes without shrinking. Smooth formula provides great results every time. Interior use. See details DAP 10308 PLASTER OF PARIS (DRY MIX) SIZE:4 LBS. See details DAP 10100 WALLBOARD JOINT COMPOUND (RTU) SIZE:3 LBS. For smooth, high quality finishing of gypsum panel joints. Easy-to-use, ready-mixed formula is easily applied, has minimal shrinkage and sands easily. Interior use. See details DAP 10200 SPACKLING PASTE (RTU) SIZE:0.5 PINT. See details DAP 58505 PRESTO PATCH MULTI-PURPOSE PATCHING COMPOUND (DRY MIX) WHITE SIZE:4 LBS. All-purpose, high-performance patching compound formulated to set fast and dry hard. Set time is 5-10 minutes and is ready to paint in 30 minutes. Great for all interior wall, ceiling and floor projects. Interior use. See details DAP 12374 CRACKSHOT HIGH PERFORMANCE SPACKLING PASTE SIZE:0.5 PINT. Professional Knife Grade Spackling Paste for easy application and superior paintability. Its creamy texture applies smoothly, dries hard and sands effortlessly, delivering quality results every time. This professional formula will not shrink and will not 'flash' paint. Interior/exterior use. See details DAP 12130 VINYL SPACKLING (RTU) SIZE:0.5 PINT. See details DAP 12140 FAST N FINAL LIGHTWEIGHT SPACKLING (RTU) SIZE:0.5 PINT. See details DAP 58550 FASTPATCH 30 PATCHING COMPOUND POWDER SIZE:3.5 LBS.